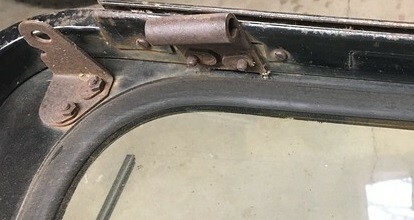 I'm looking for original a set of brackets that sit in the top left and right corner of the windshield for the horizontal rods for the top frame. One can be seen in this picture - the bracket I'm looking for is the one on the left in the picture (I do not need the door bracket). I'm looking for left and right. I don't think any of those brackets were the same , since most CJ's never came with a soft top...........the brackets that I have seen which pretty much did the same job were individually supplied by the top manufacture...........and therefore could be a little different to suit each manufactures needs to fit there top correctly......I think I would get your top on and see what position your top side arms need and then build yourself a pair and install them. Check with Midwest Military. I seem to have them on my "wish list" along with some other parts from him. I'll see if the brackets I took off are like that. I think I found what you are looking for. So how do those brackets work? They make the attaching point for the upper door bars used on the convertable top frame. I would have gladly done that, but they are probably in Minneapolis by now. Maybe Gotime can do that for you. Midwest Military sells them. If you want me to trace and send to you, LMK.